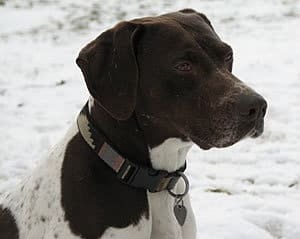 Delta is exactly what a German Shorthaired Pointer should be. She is the epitome of the universal gun dog. Delta has a mild, consistent attitude at home and an aggressive, unrelenting drive in the field. She is amenable with everyone; people of all ages, cats, horses, livestock, and fellow dogs. Delta’s unflappable nature makes her capable of any task.